Have you ever played horseshoes? It’s a fun backyard game. But when you think about it, horseshoes can be a pretty dangerous game — especially when children come running through the yard without giving a thought to their personal safety. Those hefty chunks of iron are capable of causing a fairly serious injury. There is another fun backyard game that follows the same thought as horseshoes. It’s equal in skill requirements, but reduces the weight of the object being tossed to a couple ounces and completely eliminates that dangerous rod sticking out of the ground! Washers is a family-oriented skill game that is easily portable, can be set up in a couple seconds, and is considerably safer than horseshoes. For starters, a game of washers replaces the heavy iron rings used in horseshoes with simple steel washers from the hardware store. The steel rods used to score are replaced by a wooden board with 3 holes (or a wooden box with 1 hole, depending on which “version” you’re playing). Each hole is large enough to accept a washer when accurately thrown at it. Here’s a washers photo gallery showing the primary playing pieces. You may want to check out this video of a regulation horseshoe pit, and compare that to this video of a washers game in action. It will quickly become very clear as to which game is safer with young children around! Click to see videos for each different version of the washers game! With the many different varieties of washer games that exist, you will see some slightly different box configurations that are used. The 1-hole boxes and 3-hole boards are probably the most popular. But the octagonal 2-hole box is also quite common, as is the sloped platform. 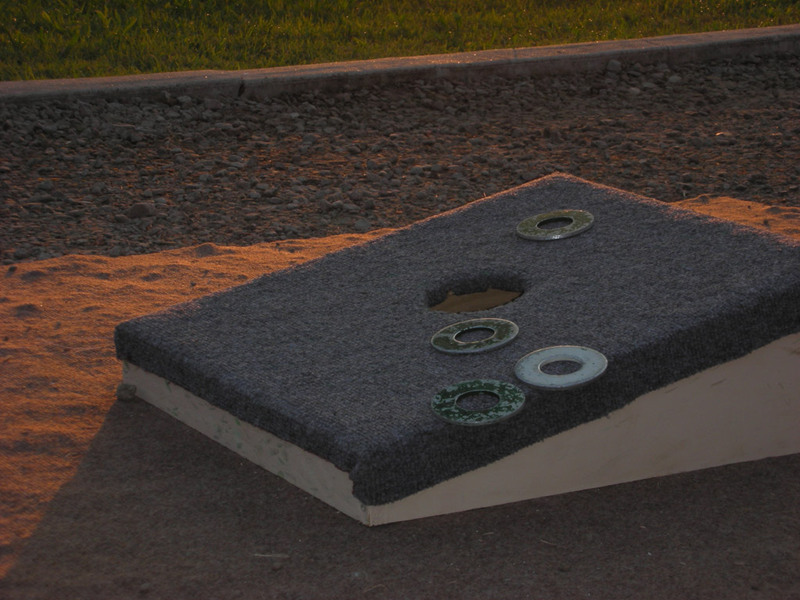 For the ultimate washers game, some diehard washers players have even built washers pits that are recessed into dirt or a sandbox. 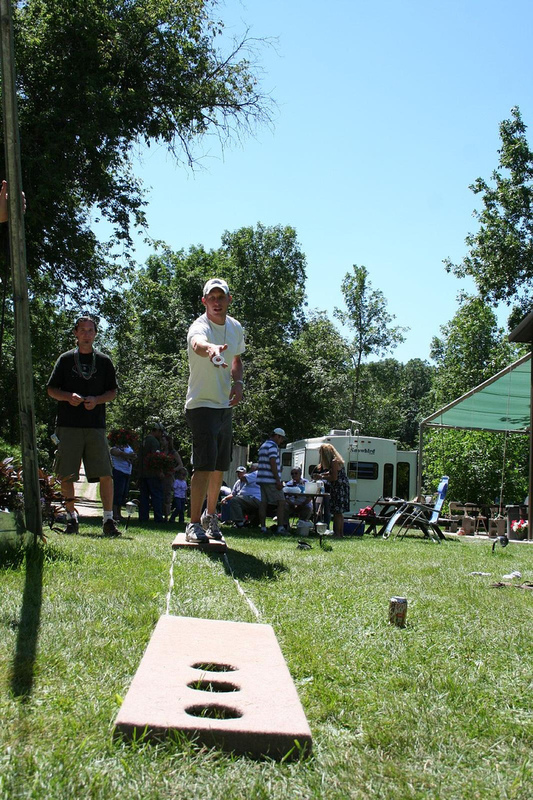 The official rules for playing a game of washers very much resemble the rules for playing horseshoes. By tossing a washer into the same hole that your opponent has hit, you will cancel out his score. The point of the game is to be the first player (or team) to reach 21. For those handy with a few tools it’s a simple matter to build your own fun washers game. Your local home center will generally have all of the components necessary to build your own washer toss game boards. Here are all of the dimensions and parts to create your own washers game. 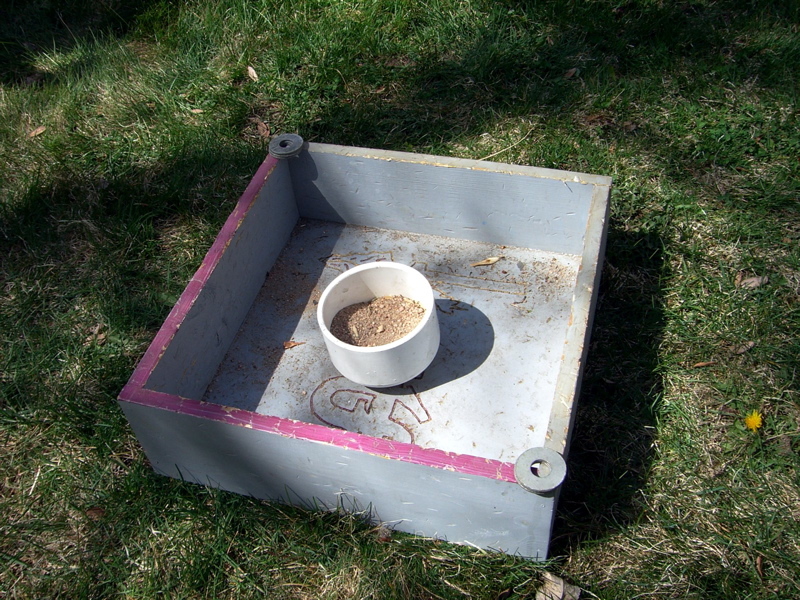 It’s worth noting that washer toss boxes have a variety of different surfaces. On some, the wood board is carpeted. On others, the wood is stained. Some even have a rubber surface to add a little bounce to the action. Without a doubt, the most common variety is the washer box (or board) with a plain wood surface. When building your own, the choice is yours!